Lamborghini has woken the motoring industry from its traditional summer slumber by revealing its most powerful naturally aspirated V12 model yet. The new Aventador Superveloce Jota (SVJ) has lapped the famous 12.8-mile Nurburgring Nordschleife circuit in 6 minutes, 44.97 seconds - shaving two seconds off the previous record for the famous German track. The SVJ makes its UK debut this week following its global premiere in Pebble Beach, USA last week. It will appear at the famous Salon Privé event, which takes place at Blenheim Palace from today until Saturday. A private customer event will be followed by a media presentation on the first day of the event, before the car is shown to the public. With 770 hp and 720 Nm of torque at 6,750 rpm, the Aventador SVJ is the most powerful, naturally-aspirated series production V12 that Lamborghini has ever produced. SV stands for ‘super veloce’ - meaning superfast in Italian. The ‘Jota’ suffice references the car’s potency on both track and road and is a nod to a superfast Spanish dance. It’s lightweight, with a dry weight of just 1,525 kg and a weight-to power ratio of 1.98 kg/hp. This combination of weight and power translates to sensational performance figures: 0-62mph in just 2.8 seconds, and a top speed of more than 217 mph. Having already proven itself by taking the production car lap record at the Nürburgring-Nordschleife, the philosophy behind the SVJ is to create a ‘demanding driver’s perfect car’, according to the manufacturer. Featuring Lamborghini’s patented active aerodynamics system and aero vectoring, both systems have been enhanced for the SVJ, along with a redesign of the chassis, enhanced powertrain, re-engineered chassis, improved stiffness, enhanced rear-wheel steering, increased stiffness and significantly improved downforce. The Aventador SVJ has also been packed with other new aerodynamic and other features that further differentiate it from the standard Aventador. 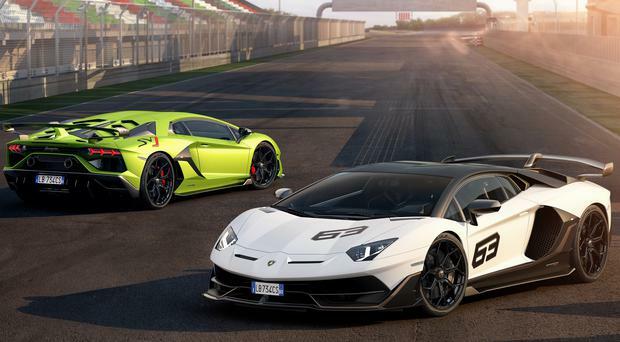 A limited edition version called the Lamborghini Aventador SVJ 63 is also in the offing - the number 63 is to commemorate Lamborghini’s establishment in 1963. Just 63 of these models will be made. There’s still no confirmation of prices for the SVJ or the SVJ 63. “We are truly delighted to host the European debut of the new SVJ,” said Salon Privé Founding Directors Andrew and David Bagley. Salon Privé is one of the UK’s longest-running and most successful motoring events. This year marks a special milestone as the event relocates to the foot of the Palace becoming the first event ever to be located on the famous Blenheim Palace Cricket Pitch.